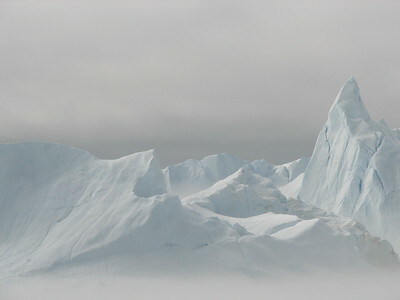 The Ilulissat Icefjord has been inscribed because of its unique glaciological characteristics and its scenic beauty. It is situated in western Greenland, north of the Arctic Circle. 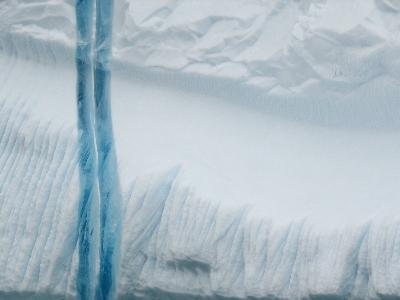 The site consists of Sermeq Kujalleq, the most productive glacier draining the inland icecap op Greenland, and the iceberg-filled fjord named Kangia. It also takes in part of the inland ice itself and some of the surrounding land. Ilulissat Icefjord is the pre-eminent glacier in the northern hemisphere. Although there are many more glacier-related sites on the World Heritage List, this site is only surpassed by Antarctica in terms of size and calving. Some WHS take about an hour to explore, others days or even weeks. To really enjoy the enormous Kangia Icefjord near Ilulissat in Greenland one has to spend there about 3 or 4 days. 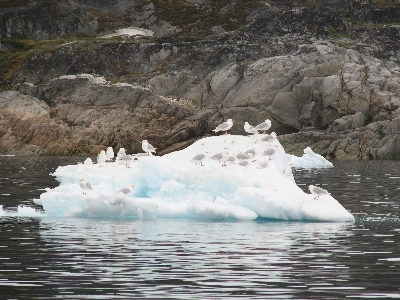 The area that has been designated includes both the floating icebergs, the massive ice pack still in the fjord and some of the surrounding lands. From Ilulissat town there are many ways of transportation to get a good look at the Icefjord. It was even possible to see the floating icebergs from the window of my hotel room, a good sight to start every day. My first real good look at the Icefjord was during a walking tour through the Sermermiut Valley. The day had started out sunny, but the closer we got to the ice the more foggy and cloudy it became. Finally, at the edge of the glacier, I could only see the smaller pieces of ice floating near the coast. Also quite interesting to see because of their different sizes, colours and shapes. We were leaving (with the idea to come here again on a brighter day), when one of our group looked over her shoulder and called out that the fog started to dissipate. A memorable spectacle unfolded before our eyes: one by one the large icebergs protruded from the fog and showed themselves (see the large photo above). The biggest ones are the size of mountains, with sharp peaks. On another day, I went on a boat tour to Ilimanaq, on the other side from the icefjord from Ilulissat. This route takes in all the icebergs that have broken away from the icepack and float around in the sea, desintegrating more and more. One or two icebergs attract all the seagulls. Others are true ice sculptures, sometimes with blue 'veins' (made by water). All in all Ilulissat Icefjord a fascinating site to visit, a wonder of nature. Reaching Ilulissat appeared to be a daunting task until I discovered Air Iceland's direct flights from Reyjavik (Iceland)'s City airport. The airline arranged my accommodation and transfers as well. Once there everything is close by, within walking distance, which is just as well as there is no public transport. I visited Ilulissat in August 2012 & was blown away by natures stunning beauty here. Over the 4 days spent here, I was very lucky with the weather, not a cloud in the sky for that period. Sunset sailing in the sea was magnificent, it’s not just the sheer size of these icebergs that have calved from the glacier that is breath-taking, but the colours emitted/reflected during the sunset period. Depending on the wind direction, the harbour in Ilulissat can be frozen or clear, but using the boat as an icebreaker to get out into the sea is also quite an experience. Some people may say that one iceberg resembles another & once you have seen one, you have seen them all. Far from the truth. Each is different! 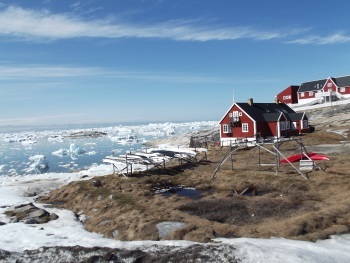 Around the mouth of the icefjord in Ilulissat is a great place to spend a day hiking. The volcanic mountains themselves are very impressive with the summer fauna in full colour, but again it’s hard to take you eyes off the huge icebergs floating in the water right beside you! Another day was spent travelling to the Eqi glacier, further up Disko bay. Again this is a very special place, due to the tranquillity of the place & the noise emitted from the calving process along with the displacement of water as these huge chunks of ice cascade from the top of the glacier face into the crystal clear water below. Some of the avalanches are massive & even though the boats are over 700 meters from the face, the bobbing motion induced from these avalanches can be very dramatic. Finally, the cost of living there is not as expensive as one might think & the supermarkets in the summer are very well stocked. Glaciers: AB review "The size of the site is 4,024 km2, comprising 3,199 km2 of glacier ice," The Icefjord is the sea mouth of Sermeq Kujalleq, one of the few glaciers through which the ice of the Greenland ice cap reaches the sea." 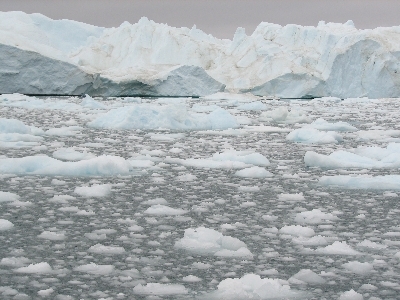 ..."The annual calving through Ilulissat Icefjord of over 40 cu. km of ice is 10% of the production of the Greenland ice cap and more than any other glacier outside Antarctica"
Atlantic Ocean: Ilulissat debouches into either Baffin Bay or Davis Strait.